than any of its kind! 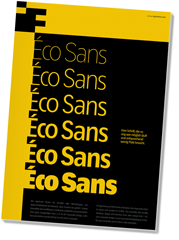 How close to each other can the characters of a font get? Theoretically, as close as you want. But obviously, the words should still be legible. And as any designer knows, body clearance of characters also depends on other parameters such as point size and line spacing. In practice, there are always situations in which as much information as possible has to be positioned in as little space as possible. 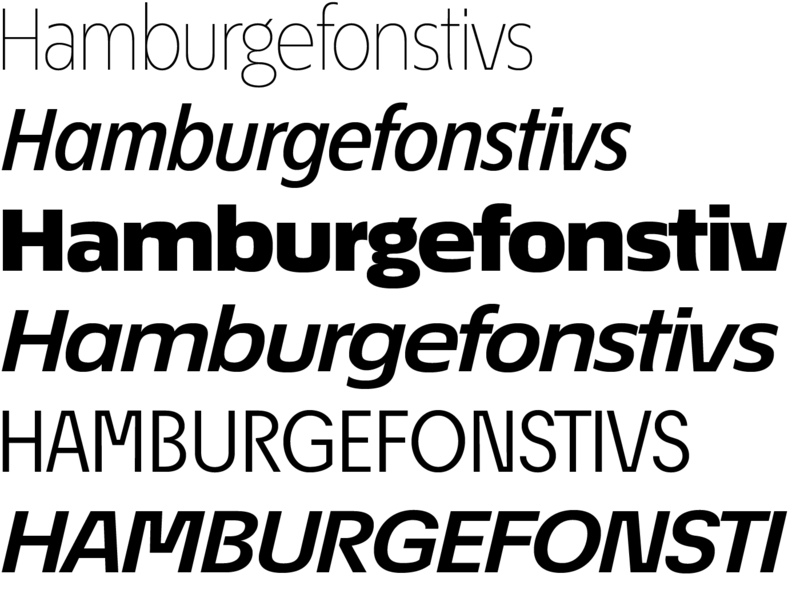 The shapes of the upper and lower case letters are completely matter-of-fact, the way a modern font has got to be. The letters c, e, and s are wide open to their neighbors. An especially distinguished trait of this font is the design of the “triangular” characters v, w, y, x, k, z and A, V, W, Y, Z, K, X, M, N. And the open form of B, R and P is also not typical in a sans serif. The distance between letters is kept tight and often the characters nearly touch, but only nearly. 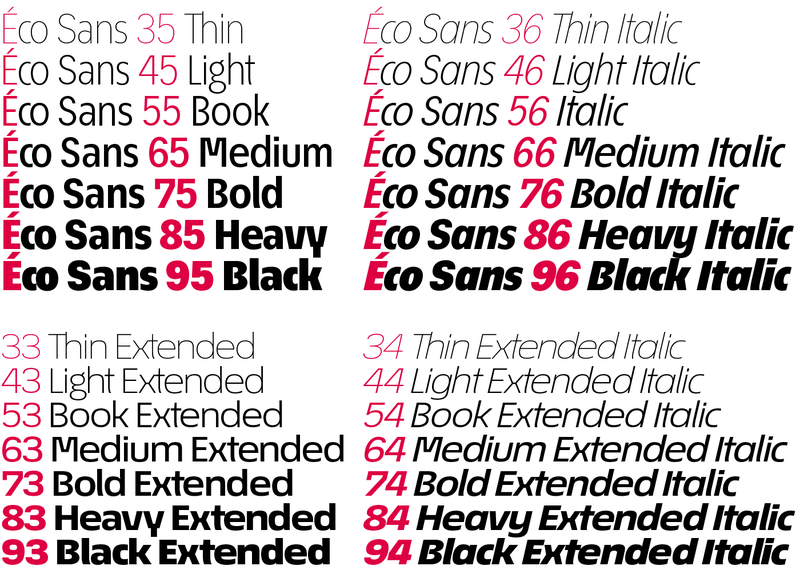 Results of a comparison*: With Éco Sans you gain approximately 20% more text in a line than with Tahoma, and even still more than 10% compared to Helvetica Neue, not to mention the old “normal” Helvetica… And if that’s not enough, Éco Sans needs even less space than Bell Centennial, recommended for “tight” cases. 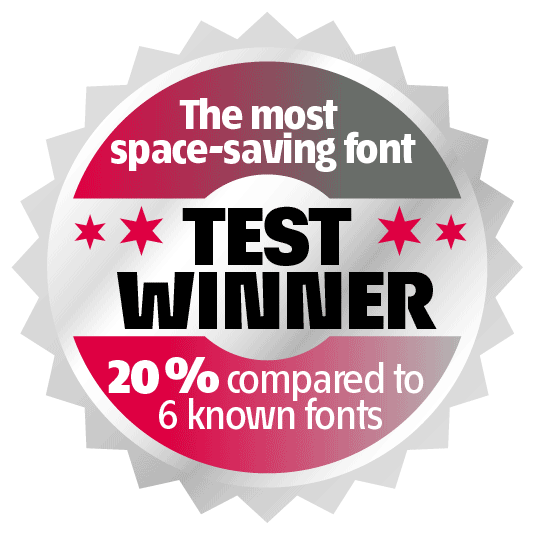 * In order to truly compare, the fonts were measured up to the same visual size, i.e. 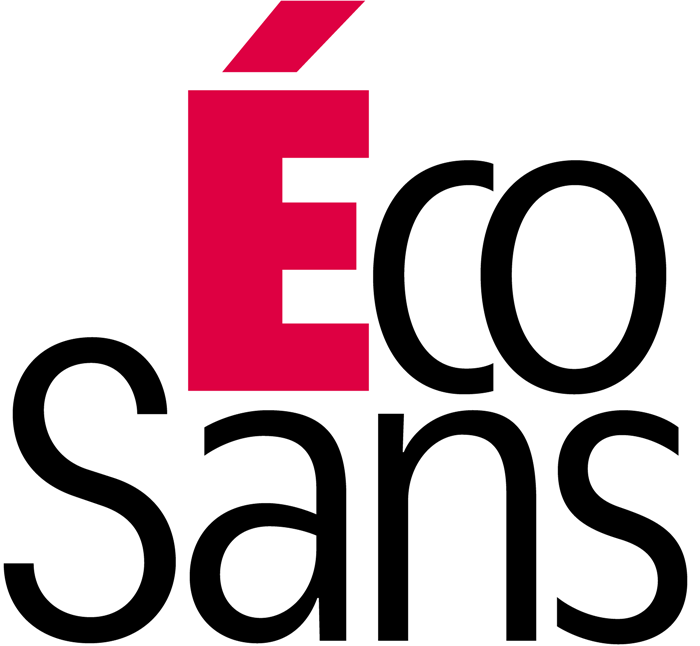 Éco Sans 12 pts, Avenir Next 12.5 pts, Bell Centennial 12.5 pts, Helvetica 11 pts, Tahoma 11 pts. 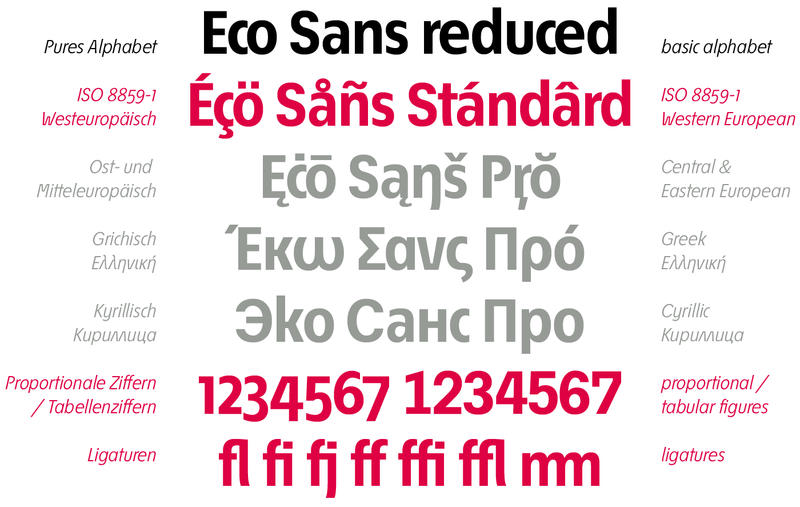 In addition to the “normal figures,” Éco Sans also includes tabular figures with unvarying width as well as ligatures (character connections). 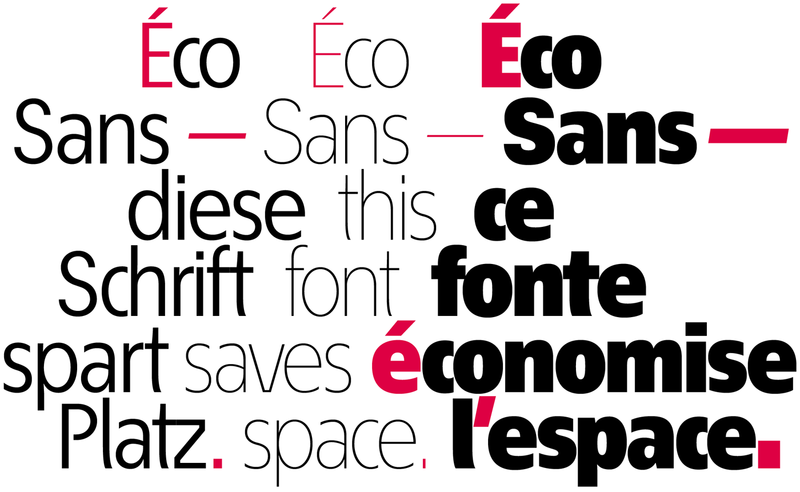 Among the ligatures, the double mm is especially unusual and is hardly familiar, but can contribute greatly to saving space without catching the reader’s eye. 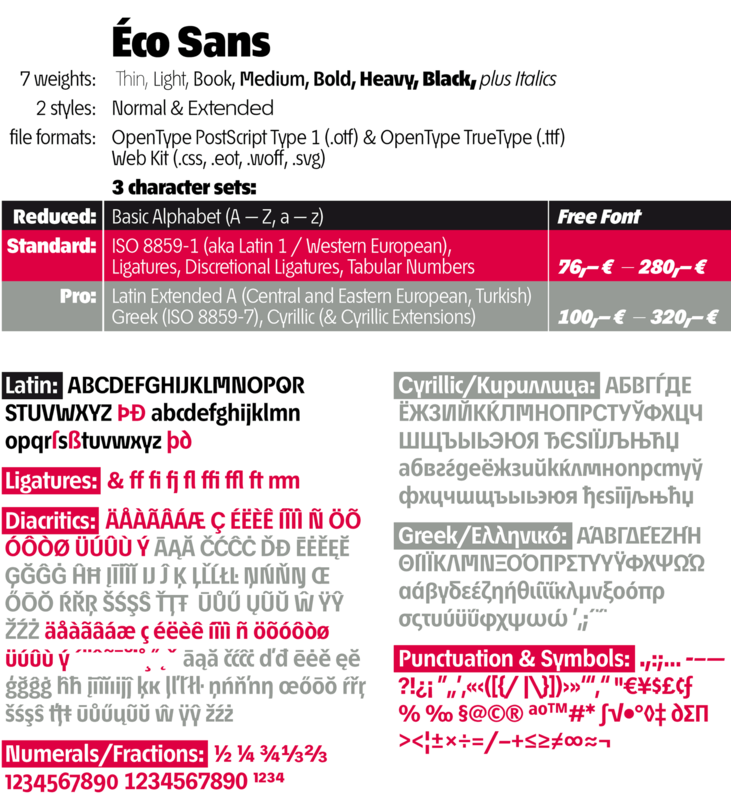 Tabular figures and ligatures can be turned on and off by means of the corresponding Open Type functions of the user program.